This DIY wedding candle centerpiece is just so simple yet so effective, which makes it a perfect DIY project. I’m always being asked to incorporate candles into brides wedding centerpieces, as they are so romantic whatever time of the year you are getting married. 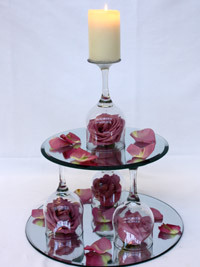 This wedding centerpiece is certainly going to add the WOW factor to your wedding table decorations. A 12 inch and a 10 inch circular mirror. 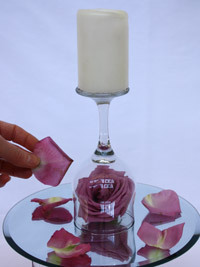 A column candle to fit the base of your chosen wine glass. Cut the rose heads off the stems. Place them into each of your wine glasses. 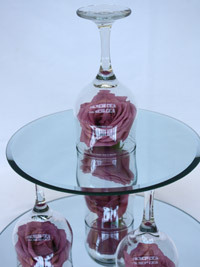 Arrange three of the wine glasses equally spaced around the largest 12 inch circular mirror. 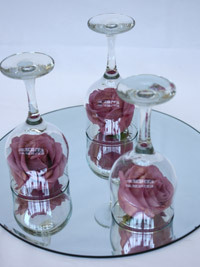 Place the smaller 10 inch circular mirror onto the bases of the up turned wine glasses. 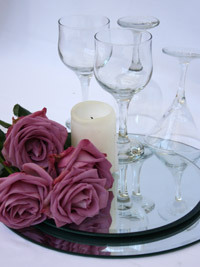 Place the fourth wine glass in the center of the top mirror. Carefully place your candle onto the base of the up turned wine glass. 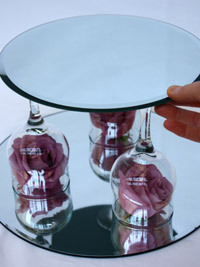 Finally pull the rose petals off the remaining rose and scatter them around both of the mirrors. 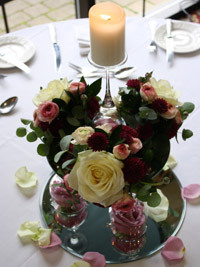 All that leaves you to do is light the candle and admire your candle wedding centerpiece. 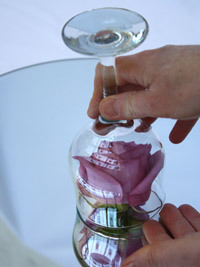 Take this tutorial a step further and add wedding flowers to this unique wedding centerpiece. Follow my step-by-step instructions to learn how to add an extra special touch to this design.